In 2013, Rocky Patel introduced their Platinum Limited Edition series of hand-rolled premium cigars in three popular sizes Robusto, Toro and Torpedo. Each of these premium cigars are constructed individually by hand using Nicaraguan fillers and San Andrés binders perfectly enclosed inside a dark and well-oiled Ecuadorian Habano Oscuro wrapper. 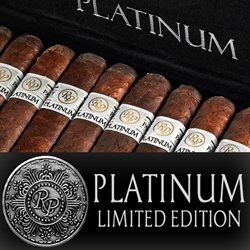 Rocky Patel Platinum Limited Edition cigars are medium to full in body, with a high-quality construction that gives an even draw producing notes of sweet spice, vanilla, leather, dark chocolate, and subtle hints of pepper. With a 92-rating, cigar lovers everywhere agree the Platinum Limited Edition is another great contribution to the cigar world from Rocky Patel!